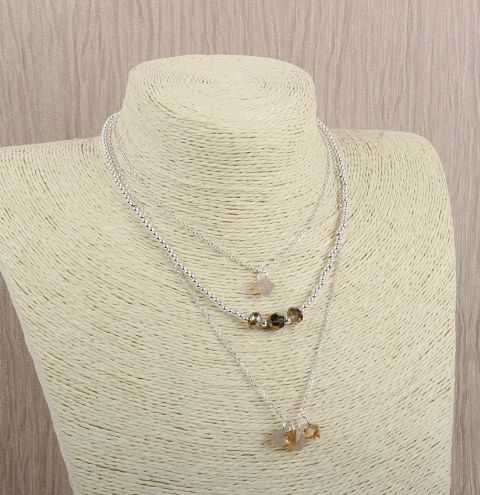 Make a trending multi-layered necklace with our new *Limited Edition* Swarovski vintage crystal mixes! Cut three lengths of chain. Cut an arm span of wire and string on the beads to fill 6 inches. Then string on a faceted bead, a shiny sterling ball, a faceted bead and another shiny bead. Then fill out another 6 inches with shiny beads. Slide a calotte onto each end of wire and then a crimp bead. Pass the wire back through the calotte, squash the crimp bead, cover the crimp with the calotte and and hide the tail end of the wire inside the beads. Attach a jumpring to another bicone beads and attach it to the 13 inch piece of chain. Now attach each piece to the ends with a jumpring. Connect two jumprings together on either side of the ends. Attach the jumpring to one side.